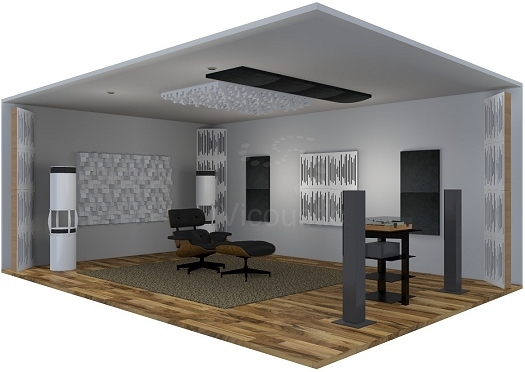 The standard modal approach for designing a room with good acoustics is to create as many different resonances as possible, and to spread them as evenly as possible across the frequency spectrum, as discussed in the Handbook for Sound Engineers. The lowest resonance is determined by the largest dimension of the room. In general, the lower the better for the first resonant frequency, because this region is where the frequency response is most variable. Bigger rooms also reduce the spacing between resonances. The limiting factor here is usually cost. For a 19-foot long room the first resonance is about 30 Hz. Every harmonic of this frequency (60, 90, 120, etc.) is also a resonance. The width and height of the room each give rise to another series of resonances. These are the primary "axial" resonances, involving reflections from two opposing surfaces. Additional resonances are created by reflections that ricochet off four different surfaces. These "tangential" resonances are generally weaker, because energy is lost at each reflection. Finally there are "oblique" resonances which ricochet off all six surfaces. Each resonance gives rise to a "mode" with a characteristic spatial pressure variation. To spread these resonances as uniformly as possible, various ratios between the room height, width, and length have been proposed. Three such sets from the Handbook for Sound Engineers are used for this calculations.